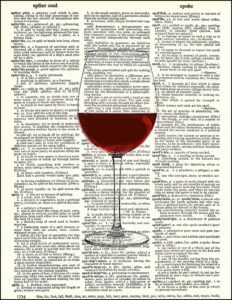 What’s a seat at the Worldwide Wine Table without being able to “talk the talk?” We’ve compiled this list of popular Wine terms for you to use out and about, and have added a “Wine with the Vine” section under the terms to help you integrate these into your next Wine Night! This section either includes direct quotes you can use or other methods of application. Acidity: Can be used to describe both red and white Wines. It’s typically more pronounced in white wines because there is little to no presence of tannins. The easiest way to experience acidity is imagine biting into a lemon—your lips will pucker and your Salivary glands will go to work. Wine with the Vine: A wine with higher acidity pairs well soft cheeses and creamy dishes like Fettuccine Alfredo because it serves as a metaphoric windshield wiper preparing your palate for the next bite. Tannin: So, you’re really going to use this term with red Wines. The opposite of acidity, tannin removes the moisture from your palate. Tannin is a phenolic compound that comes from grape skins, seeds, stems, and oak aging. Think of tea that has been steeped for too long, and the astringency that you feel in your mouth when you take a sip. Vintage: This is the year that you see red and white wine bottles. The term refers to the year that the wine’s grape(s) were grown and harvested. Great growing conditions in certain years denote great vintages. These fine wines tend to be more valuable. Wine with the Vine: I’ve heard that 2012-2016 were all great vintages in California! Varietal: This term refers to a single wine grape variety. Some examples of varietals include: Sauvignon Blanc, Chardonnay, Cabernet Sauvignon, and Merlot. Body: This references the weight and feel of a wine on your palate. We compare “body” to the feeling of milk on your tongue—think skim milk vs. whole milk. After a sip of each, you realize the “feel” of the whole milk will linger longer on your tongue. Think a Napa Valley Cabernet or an Australian Shiraz as “full body” wines and Sauvignon Blanc, Riesling, or Pinot Blanc as “light body” wines. Legs or Tears: The streams that form when wine coats the inside of the glass. This is not an indicator of quality, rather an indicator of high alcohol &/or sugar. Wine with the Vine: What NOT to say… “Look at the legs on this wine! I can tell it’s going to be amazing”! Trust us. You can’t. Swirl: There’s a reason behind that fancy swirl. Swirling the wine in your glass lets in oxygen, which acts as a catalyst to help open up the aromas in the wine’s bouquet. Palate: In its literal sense the term “palate” references the roof of your mouth. When enjoying a wine, taste (after smell) is the most important sense. Terroir: This is a commonly misused term. Terroir references the natural environment the wine grape/s are grown including the soil, climate, and topography. The same grape (Sauvignon Blanc for example), will show different characteristics in different terroirs. Think of the differences in Sancerre (which is Sauvignon Blanc) from the Loire Valley in France, vs New Zealand Sauvignon Blanc.